Bring animals into your classroom with HSHV’s Animal Care Education! 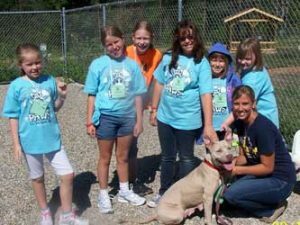 Specially designed by the humane education team at the Humane Society of Huron Valley, our Animal Care Education (ACE) programs meet many Common Core and State Standards. Each ACE presentation is $55 and includes up to 40 participants (or 2 classrooms) within Washtenaw County or Plymouth Township. (Just outside our area? We can extend for a small fee; contact us for more.) Add a shelter dog visit for an additional $20! A limited amount of partial scholarships may be available for schools in financial need. “Paws”itively Safe: In this program participants will learn how animals communicate through body language, how to safely approach and greet an animal and what to do if they encounter an animal they don’t know. After this program participants will become animal safety experts! Safe, Healthy and Happy: You, Me and the Whole World, Too! What do we have in common with the non-human animals we share the world with? In this program participants will examine clues to discover what all animals (including people!) need to be safe, happy and healthy. Participants will think critically about how to help animals meet these needs, as well as build empathy by considering the commonality we share with each other and non-human animals. Kind Kids: At HSHV we know that kids help us create the compassionate community we live in! In this program participants will assess the effect they have on the world around them by looking at the world from the point of view of a much smaller animal. Participants will think about how they can show compassion through the daily choices they make. Through Your Eyes: In this program, participants will look at the world through the eyes of an animal. Participants will view a human-animal conflict from the perspective of both a person and an animal and consider humane solutions to the conflict. A program for both critical thinking and empathy building! Animal Adaptations: How does a polar bear stay warm in the Arctic? How can you tell what a bird eats by looking at their beak? In this hands-on program participants will learn about adaptations and how plants and animals develop adaptations in order to better survive their habitat. Perspectives & Poetry: Who do we give our empathy to and why? Beginning with the reading and analysis of a poem, in this program participants will put themselves “in the shoes” of another and consider a human-animal conflict from the perspective of both a human and a non-human animal. Animal Adaptations – Sharing the City: “Wild” animals are becoming more and more common to see in urban and suburban settings. In this program participants will examine the adaptations that some animals have developed in order to better survive alongside people. Participants will discuss possible solutions to human-animal conflicts that have occurred as a result of these animal adaptations. Working for Animals – Careers in Animal Welfare: In this program participants will learn about the many different departments that work together to help animals at HSHV. Participants will learn about the different careers available at HSHV, the education required and daily tasks involved in each job. Compassionate Quotations: Which animal is more important: a bear, a pig or a dog? In this program participants will examine their own beliefs towards different animals and how those beliefs may have formed. Participants will study various attitudes held about animals throughout history and will formulate their own “compassionate quotation” to contribute to history. Love Starts Here – How HSHV Helps Our Community: Do you have a group who is interest in learning about HSHV? Participants in this program will learn the history of our organization, information on our day to day operations and how we are helping our community to be a compassionate place for all animals who live here, including humans! Communicating with Animals: Just like learning another language, this program provides the tools to decode what animals are telling us by identifying animal body language characteristics. Participants in this program will learn how to interact safely with animals by reading animals’ non-verbal cues to assess their feelings.